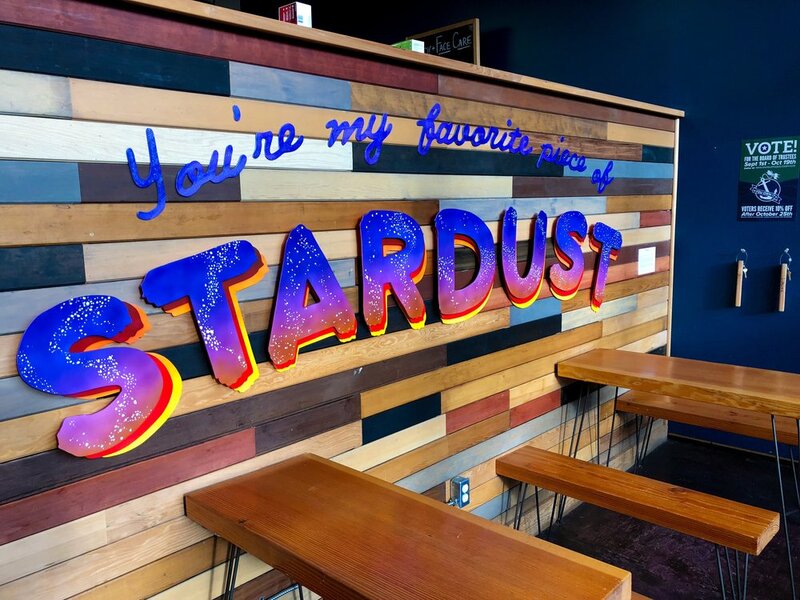 Local artist Cat Snapp has installed an amazing stardust inspired art piece at the Sno-Isle Food Coop. Snapp specializes in letterpress stationary, greeting cards and more. “Among all of the incredible digital tools incorporated into our lives, there is still power in ink on paper,” Snapp writes on her website. The Stardust piece at the Co-op is no exception. We talked to Snapp about her newest work. First off, when I saw photos of this I thought it was photoshopped. It's such a unique looking piece with so much dimension. What is this made out of? Oh, that's interesting! I was aiming for a really bright, colorful piece that stood in contrast with the natural wood background, and I wanted it to invite customers at the Co-op in from a distance, so I guess I achieved that considering how much it jumps out! I hung out for a few minutes after I installed the work and enjoyed seeing everyone taking it in as they moved through their day, which is what I hoped for! The piece is made out of foamcore that I cut by hand using a scalpel, then painted using an airbrush and paint brushes. What was the process you went through to create this? The design and phrasing area from one of my greeting cards. I kept envisioning it on a much larger scale than a few inches. I was able to take my initial card design and play with size on my computer after taking photos and measurements of the Co-op dining space. I prefer working analog with paper and pencil, but decided to embrace the digital to make sure my idea could be executed! Once I decided on scale, I printed a black and white version of it to size to use as a guide for cutting the letters out. I wanted the lettering to come off the wall a few inches and planned on three layers of "stardust", so I meticulously cut out the letters one by one with a scalpel and burnished the edges, airbrushed each layer of letters with a gradient of colors, including the backs. The top layer of "stardust" I wanted to look like stars in a twilight sky, so I used a combination of masking fluid and glitter paint to create stars. Once I'd painted everything, I assembled the layers together and installed the pieces in the dining area by eye using a removable adhesive to prevent the walls from damage. Overall, it took about three work days and an all-nighter to complete! I made this for my husband, Mike, who's the inspiration behind a lot of my work. I remember reading years ago that scientifically we're basically made of stardust. I think it was National Geographic or something, and I just loved how poetic and expansive that idea felt, but also that we're so small in the universe that we're just specks of dust. I found the concept fascinating and thought very plainly, "Well, if we're all stardust, my husband, is my favorite of them all." Where else can people check out more of your art? My piece will be up at the Sno-Isle Food Co-op for a month and some of my boxed sets of greeting cards are available there this month too! Schack Art Center carries an assortment of my cards and journals. Hmmm, if you do a blog post, can you include that I'm teaching a series of holiday workshops at the Schack Art Center in November and December? Folks can sign up for one or all of them! Of course, we can. Sign up for Snapp’s classes at Schack Art Center. And go see her work at Sno-Isle Food Co-op. Find out more about CAT SNAPP STUDIO. Garret loves art. Especially by locals. He also co-hosts the Live in Everett podcast and Live in Everett TV.